With the men home from war and the economy booming, the first major post-World War II baseball card set was released by the Bowman Gum Company in 1948. The 1948 Bowman baseball cards were issued in one-card penny packs that included a piece of bubble gum. The cards were much smaller than today’s baseball cards, and measured only 2-1/16” by 2½” and were printed in black and white. The front of the cards are very plain and contain no text, just a basic black and white photograph. Exactly one-half of the cards in the 1948 Bowman set were of players that played for the Giants or Yankees, while the NL champion Brooklyn Dodgers only had 3 players represented. This was probably a smart move from a business standpoint, as New York traditionally had the best teams, the most fans, and was the nation’s biggest market. Although, the 1948 Bowman baseball card was issued nationally, it is clear that Bowman was targeting its first post-war set at the island of Manhattan and would be watching from Philadelphia with great interest. Because this was first major set of baseball cards issued since before World War II, the majority of the cards (62%) are rookie cards. Among the 30 players making their first appearance on a card, nine would be elected to baseball's Hall-of-Fame, which is a record for post-war sets. These future Hall-of-Fame players in the 1948 Bowman set include: #3 Ralph Kiner, #4 Johnny Mize, #5 Bob Feller, #6 Yogi Berra, #8 Phil Rizzuto, #17 Enos Slaughter, #18 Warren Spahn, #36 Stan Musial and #38 Red Schoendienst. In 1948, Bowman was forced to use the photos that they had available to create the cards. The results were very mixed. 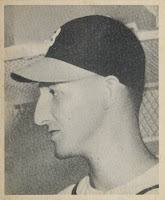 Warren Spahn's card is probably the most disappointing rookie card of a Hall-of-Famer ever printed. 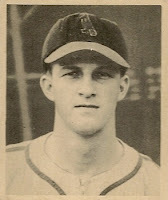 Evidently, this was the best photo of Spahn that could be found before the printing deadline. 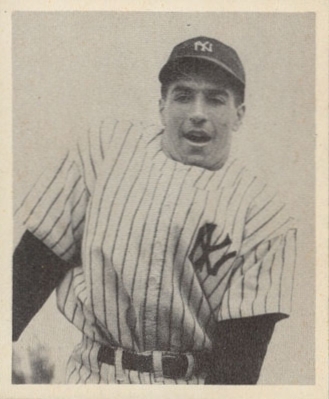 The strangest card in the 1948 set has to be the one of Phil Rizzuto. This photo gives the impression that Rizzuto has a pillow tucked inside of his shirt. As the first baseball cards produced in seven years, the 1948 Bowman set has some unique quirks. The 1948 Bowman baseball card set was designed to be issued in one series of 48 cards. The problem is that a printing sheet contained 36 cards, so the set would have to be printed in two separate sheets. It is unclear as to why Bowman decided to issue a set with only 48 cards. It could be that Bowman had signed contracts with only 48 players, which would explain the large number of players from the New York-based teams. A more likely scenario is that after a seven-year break in producing cards, Bowman had to re-educate themselves on the manufacturing process. The first printing sheet contained cards numbered 1 through 36. It was the second sheet that created the dilemma. The second printing sheet contained the remaining dozen cards of the 1948 Bowman set, but still had spaces for another 24 cards. The cost of a printing a sheet of cards is basically the same, regardless of the number of images or cards it contains. Since there were no additional costs involved, Bowman executives decided "double print" 24 of the cards that had already been included on the first sheet of cards. According to most traditional price guides, the 1948 Bowman baseball card set contains 12 short-printed cards and 12 high-numbered cards. After consulting the DeansCards.com inventory, the surviving population of 1948 Bowman Short-Print and High Number cards seems about the same. It also appears that the same number of sheets were printed for both of the print runs, so my conclusion is that one-half of the cards in the 1948 Bowman baseball card set had twice the number of cards printed as the other half of the set. Bowman quickly discovered that the printing costs for a 72-card set is almost the same as that of a 48-card set, so they quickly corrected their mistake by the time they issued their football card set that fall.. Bowman used this card size for several more baseball, football, and non-sports card sets until they eventually increased the size of their cards in 1951. It is interesting to note that the number of cards in each of these sets is divisible by 36, eliminating the problem of short-printed cards. Luckily for collectors of the short-printed cards, the only superstar is #8 Phil Rizzuto. Even with 24 "short-printed” cards in the set, the 1948 Bowman set only ranks as "moderately difficult" to complete. The Bowman Gum Co. knew exactly what they were trying to accomplish in 1948, therefore they were able to succeed. Bowman wanted to issue a “national” set and not be limited to just one region of the country; and that they did. The 1948 Bowman baseball card set contains players from 10 of the 16 major league teams. The 1948 Bowman baseball card set was a very modest offering by all standards. Considered the most basic of all the Bowman sets, 1948 Bowman set was an important first step in the evolution of the baseball card. It was the first set of the modern era of baseball cards, and ultimately ushered in a decade great sets. By doing things on a small scale in 1948 – a plan that Topps would replicate in 1951 - Bowman learned some very valuable lessons and was then able to come out with a much larger and better set of cards the following season. Even with a virtual monopoly on the bubble gum baseball card market, Bowman would steadily improve its product offering over the next five years.